Using the grisly tale behind the name “Grendel” as a basis for their music, Grendel has successfully emerged as a dark and chaotic force in the underground electronic scene. In 1997 Grendel was formed although this was not the band’s original name. It wasn’t until the band as it was known split up that the remaining members decided to change the name. “Grendel” was a beast in the classic mythological story of “Beowulf” that would lure people from villages and drown them in marshes. The new name and line up helped to create a unique aura for the band that attracted thousands of fans across Europe. In 2000 Grendel released their first promo CD which included the song “Strangers,” a club hit in the Netherlands. As the promo got more air play, it gained momentum and ultimately scored popularity in Germany, Belgium and Spain. Eventually many fans became anxious to see the band live and after many requests, [FLRS] (live synthesis and engineering) joined the band. Only six months later, the band released its first demo CD entitled Inhumane Amusement which caused the German record label NoiTekk to sign the band almost immediately. After being signed, Inhumane Amusement was re-mastered, re-designed and combined with new material. The new version of the album was released in 2000 as the band’s debut release. In 2002 Grendel released the End of Ages EP which became an international hit. The release included remixes by Feindflug, Arzt+Pfusch and God Module which proved to be an innovative venture for the band with the use of obscure samples over harsh and pounding EBM arrangements. Grendel’s third album entitled Prescription : Medicide, was originally released in Europe in 2003, and shortly after [FLRS] departed from the band. He was replaced by [4N1T4] who now performs with the band on stage. Prescription : Medicide was released in North America by Metropolis Records in 2004. The album featured ten tracks that included the use of orchestral sounds over deep layers of electronic beats that demonstrated the mysteriousness and corrosiveness that is Grendel. After releasing their North American debut album, Grendel unleashed their 2005 onslaught, the Soilbleed EP. Featuring five tracks and two remixes, Soilbleed continued Grendel’s reign of terror with crunching bass-lines, eerie melodies, raspy vocals and beats that could bring the dead back to life. Following up their 2004 album, Prescription: Medicide, Grendel returned with Harsh Generation in 2007. Featuring ten brutal tracks of harsh EBM and electronics, Harsh Generation had one motive in mind – to get your adrenaline flowing. Distorted vocals, acidic synth lines, pummeling bass-lines, and jagged melodies streamline the release to make it the most addictive Grendel assault to date. 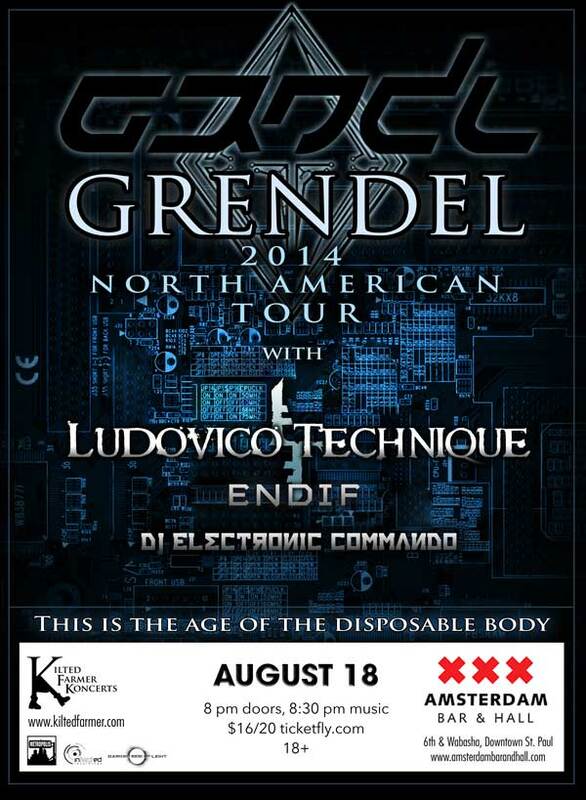 Over the years, Grendel has successfully emerged as a dark and chaotic force in the underground electronic scene. After the success of Harsh Generation, Grendel will return in 2010 with the EP Chemicals + Circuitry. This long awaited new sonic assault features three brand new tracks and wicked remixes by Komor Kommando, Modulate, Dym, Synthetic Dream Foundation, Thomas Rainer & more. After their debut album “Some Things Are Beyond Therapy” in 2012 and the follow up “We Came to Wreck Everything” in 2013, both released by Metropolis Records worldwide, Ludovico Technique have stormed the scene with their unique take on harsh industrial music, drawing from old school influences and an emotional drive to produce a sound that expresses an understanding of the dark aspects of the human experience and the depths to which man’s mind can deteriorate. Ludovico Technique bring every ounce of the music’s emotional gravity to live shows in full force, delivering performances that fully reflect the intensity of the sound itself in the form of a physical, visually stimulating stage show. Under a wash of rhythmic lights, songwriter/vocalist Ben V- unleashes visceral energy into every song, accompanied by keyboardist Evan B. and drummer Alex A. to create a dynamic audio/visual live experience for each viewer. Ludovico Technique bring a passionate force all their own to every performance, keeping focus on the artistic integrity and expressive sincerity that continuously define the music. Endif was spawned in 1991 by Jason Hollis as a means of extracting the sounds and songs rattling around his cranium. Experimentation, live performance, technical accumen, and pushing aesthetic boundaries are core values. Emphasis is placed more upon energy, emotion, context and texture than on stale commercial formulas, towering arrangements or catchy pop hooks. The output is genre-irrelevant, yet given the often harsh soundsets involved, often gets lumped in with the ‘Power Noise’ catch-all category. Which is fine, as that seems to be where most of the innovation is. Initial efforts were simple, often very low grade, poorly recorded, purely exploratory. Subsequent efforts built upon lessons learned, and soon was fit for human consumption. Nearly all of this has been archived, recycled, and used as a sonic mulch pile from which to build new compositions. As a result, even the newest tracks using the cleanest production methods still retain a heritage of decay to varying degrees. Endif draws upon a broad spectrum of experiences and influences and distills them into weapons-grade hard-electronic; Original sonic compositions incorporating a syncrete of techniques with a mind altering rhythmic bent and a fierce uncompromising aesthetic. This entry was posted in Past Shows and tagged aggrotech, amsterdam, concert, ebm, grendel, harsh ebm, idm, industrial, metropolis records, minneapolis, minnesota, saint paul, st. paul, twin cities. Bookmark the permalink.